Posted by shawnpci in Fire Protection, Fire Systems, FSSA, Iowa Alarm Association, NICET. The Great Plains Fire Suppression Symposium set for September 13, 2016 in Omaha, Nebraska will highlight industry innovations in NFPA standards, agent delivery systems, fire extinguishing technology and ATF-mandated considerations. Experts in all four subjects will present during the morning-long event. Bay Alarm Co. and a member of both technical committees. He’ll provide background and insights on these important documents and outline key factors on how best to implement these requirements that bolster stakeholder confidence in all fire systems. Innovations in Fire Suppression System Technologies provides an understanding from Tim Carman, P.E. Regional Sales Director; Janus Fire Systems on how maximizing agent delivery technologies are impacting fire suppression systems by using higher discharge pressures. Innovations like these are making fire suppression more affordable and accessible than ever. Hybrid (Nitrogen-Water Mist) Fire Suppression Technology and the new NFPA 770 is a truly unique opportunity to learn directly from the patent holder, Robert Ballard, P.E. Fire Suppression Technology Manager with Victaulic, on how the advanced technology of hybrid fire suppression systems are addressing real-world applications. Plus an update on how the new NFPA 770 standard is being developed to address these systems. Understanding ATF Regulations Affecting Fire Suppression Releasing Devices is crucial for anyone involved with such systems. Shane Mullen, Managing Director of Device Disposal and Consulting will highlight key requirements for safely handling and disposing of these devices. The Symposium is a free half-day symposium dedicated to information and education for professionals involved with fire suppression as owners, consultants, specifiers, and end-users. Continuing Education attendance credit will be provided to each attendee. A buffet breakfast will also be provided. Seating is limited, so reservations are required. Visit www.protexcentral.com to learn more and register today! Posted by shawnpci in Fire Protection, Fire Systems, Iowa Alarm Association, Mass Notification Systems. 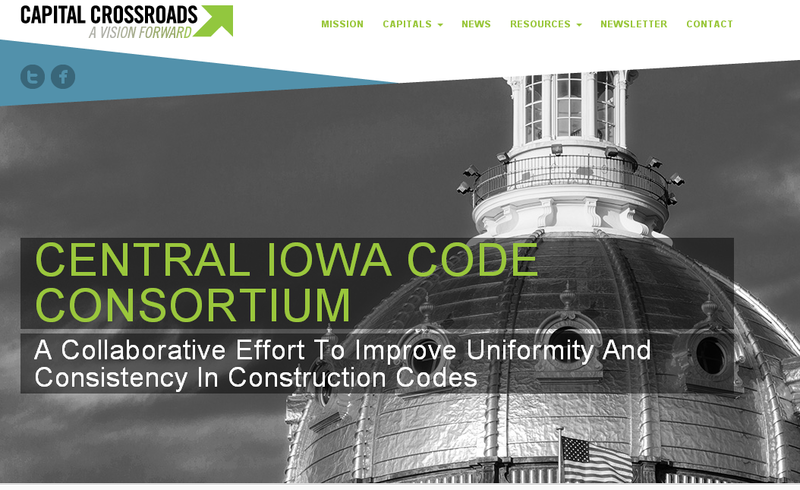 The Central Iowa Code Consortium (CICC) announced on August 1, 2015 that code proposals will be accepted for all of the International Code Council’s construction and maintenance codes through September 30, 2015. During the coming months seven code committees, made up of local government and industry representatives, will review the 2015 editions of the International Codes as well as local proposed changes to those codes. The CICC is a collaborative effort between all participating communities to review code changes, recommend changes to these codes, and produce a metro “model” code for all communities to consider through their local code adoption process. This project does not propose to make recommendations on permit process, code administration, appeals processes, or specific local amendments deemed necessary by local code officials. The goal is to publish a metro code that would promote uniformity and consistency between local communities. Central Iowa communities with memos of understanding in place to participate in the CICC process include: Altoona, Ankeny, Bondurant, Carlisle, Clive, Des Moines, Grimes, Johnston, Norwalk, Pleasant Hill, Polk City, Urbandale, Waukee, Windsor Heights, West Des Moines and Polk County. Anyone can submit code proposal through the on-line submission form located here. For more information on the Capital Crossroads Vision, click here. Posted by shawnpci in Fire Protection, Fire Systems, FSSA, Good Stuff to Share, Iowa Alarm Association, Mass Notification Systems, NICET, Uncategorized. President, Eric Burkland, welcomed over 190 delegates to the opening session of the 33rd Annual Meeting of the Fire Suppression Systems Association at the Sandpearl Resort in Clearwater Beach, Florida. Burkland thanked all those in attendance for making the effort to attend and support the robust health of the organization. With 17 new members during the last year and an upswing in revenues from dues, annual meeting fees, increased publication sales and promotions of the new training program, Burkland reported on the significant strides the association as made in the last 12 months. Several committee reports followed Burkland’s opening remarks including Steve Carter, the FSSA’s current treasurer. Carter recapped several financial highlights and credited the membership with promoting addtional new members as well as supporting the on-line training program and publications. Dan Hubert, chair of the Technical Committee, shared his committee’s activities by outlining the numerous tasks that the Board of Directors has charged them with including new Guides covering Hazard Analysis/Hazard Protection; “Clean” Gaseous Fire Extinguishing Agents; and two additional separate Guides on Water Mist and Hybrid Systems. Hubert also promoted the fact that several existing Guides are in their 3rd edition: Pressure Venting and Pipe Design. The Testing Guide for use with Special Hazard Fire Suppression Sytems is in its 4th edition. 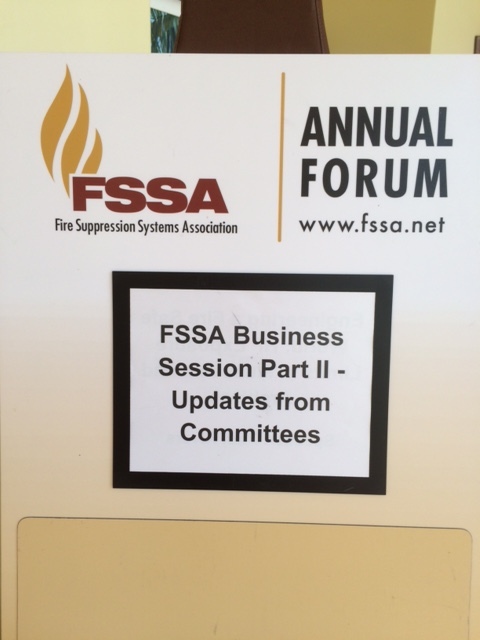 FSSA’s Codes and Standards Oversight Committee Chair, Derek Wester, presented a comprehensive overview of FSSA’s participation on over 23 NFPA committees and noted that there are currently seven vacancies on various committees that FSSA needs to fill. Wester also announced that an added benefit of FSSA membership will be exclusive access to all NFPA committee meeting recap notices filed by FSSA representatives. This invaluable resource will help keep FSSA members up-to-date on specific committee actions and new developments within the codes and standards committees represented. The expanding awareness of public policy by the FSSA was reviewed by Bill Eckholm, committee chair. Eckholm touched on numerous international agreements involving climate change and their affect on the special hazards industry. Along with the several protocols being watched, Eckholm highlighted two efforts in the U.S. that warrant members’ attention: Senate Bill 2911 seeking to authorize EPA to regulate short-lived greenhouse gases using the SNAP and the Super Pollutants Act. Eckholm invited all members to be vigilant with keeping FSSA’s headquarters appraised of any local or state initiatives affecting the industry as well. The final committee report was offered by Joe Ziemba, chair of the Marketing Committee. He summarized the many efforts now underway to promote the FSSA to new and diverse audiences. The overall goal of the committee’s efforts is being led by P E G: Promote; Educate and Grow. In each task, the committee seeks to advance awareness of the FSSA in various formats and venues. Promotion of industry Guides as well as the On-line Training Program are beginning to take shape with this committee’s efforts. A future activity involves development of FSSA sponsored webinars which will focus on various topics important to the industry. The 33rd Annual Meeting continues tomorrow, Monday, February 23rd. Posted by shawnpci in Fire Protection, Fire Systems, FSSA, Good Stuff to Share, Iowa Alarm Association, NICET, Uncategorized. Shawn Mullen, SET, President and Chief Energy Officer of Protex Central, Inc., was recently highlighted in a column by David Elbert of the Des Moines Business Record. The focus of the article was the “magic” of 3M’s Novec 1230 Fire Protection Fluid. Posted by shawnpci in Fire Protection, Fire Systems, Iowa Alarm Association, NICET. The following letter was submitted to the Des Moines Register in response to the April 6, 2014 article, Des Moines to “rethink” fire safety. The April 6th Reader’s Watchdog article, Des Moines to ‘rethink’ fire safety, provided a timely revisiting of the importance of building and fire codes in the ashes of the former Younker’s fire. March 28, 2014 fire destroys former Younker’s flagship store in downtown Des Moines. Des Moines and its capable fire department are to be recognized in taking prudent action by adopting the International Fire Code and for employing two fire protection engineers. While these actions are commendable, they are not the only efforts that have been undertaken to protect the citizens of Des Moines and Iowa. In 2004, the Legislature enacted licensing for fire protection systems contractors and installers (Chapter 100C). Law requires contractors and their employees engaging in the layout, installation, service or testing of fire protection systems be licensed by the State Fire Marshal’s office. A contractor’s responsible managing employee must attain certification in fire protection from the National Institute for Certification of Engineering Technicians. Individual workers, too, must show certification for their respective disciplines. Currently, over 110 contractors and 670 individual professionals are certified. Left unregulated and ignored, fire is an equal opportunity disaster. With vigilant attention to codes and standards by authorities, owners, contractors and their employees, all Iowa residents benefit from continually rethinking fire safety. Posted by shawnpci in Fire Protection, Fire Systems, Iowa Alarm Association. The City of Des Moines Fire Prevention Bureau issued a policy statement dated November 14, 2013 clarifying its position on various licensing requirements related to fire alarm and fire suppression systems work. FPB Policy 2013-1 references Section 104.1 of the 2012 International Fire Code (IFC) and is an official interpretation of relevant sections of the IFC, NFPA 72 The National Fire Alarm and Signaling Code as well as NFPA 17A Standard on Wet Chemical Fire Extinguishing Systems. The statement goes on to state that persons performing work on either fire alarm systems or pre-engineered fire suppression systems within the City of Des Moines, must provide a copy of the applicable Iowa State Fire Marshal’s license for the system to be worked upon. Previous licenses issued by the City of Des Moines Fire Prevention Bureau will no longer be valid. For information on the licensing requirements of the Iowa State Fire Marshal’s office, visit http://www.dps.state.ia.us/fm/building/alarm/index.shtml. Posted by shawnpci in Fire Protection, Fire Systems, FSSA, Iowa Alarm Association. 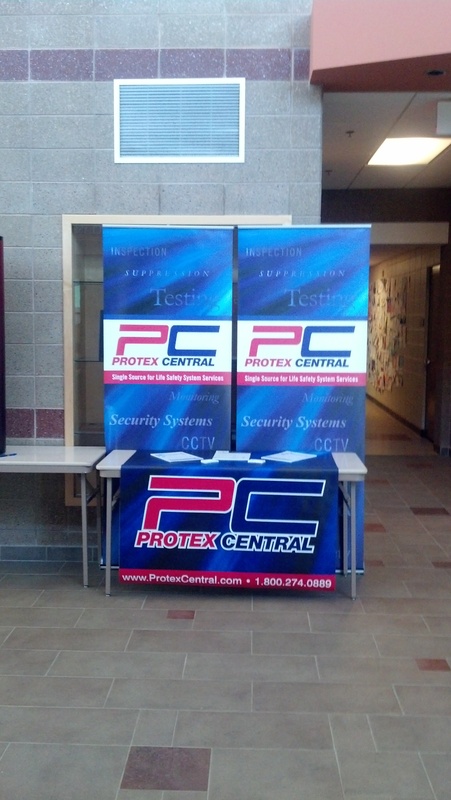 Protex Central recently presented to annual meeting of the Hawkeye State Fire Safety Association at the new Fire Department in Ankeny, Iowa. The gathering of over 100 building, fire and code officials from across Iowa featured education sessions on a variety of current topics including the latest revisions to the International Building Code and International Fire Code. Protex Central presented a noontime review of recent changes in agent design concentrations featured in the 2011 edition of NFPA 2001 Standard on Clean Agent Fire Extinguishing Systems. Shawn Mullen, President and Chief Energy Officer at Protex Central, delivered the presentation and fielded questions from the attendees. For more information about the Hawkeye State Fire Safety Association click here. In addition to Lund Fire Protection, owner Jonathan Lund, currently serves as President of the Hawkeye State Fire Inspectors Association. For additional information about this new process, contact Cory Pergrande at the Waukee, Iowa Fire Department or via e-mail at: cpergande@waukee.org. 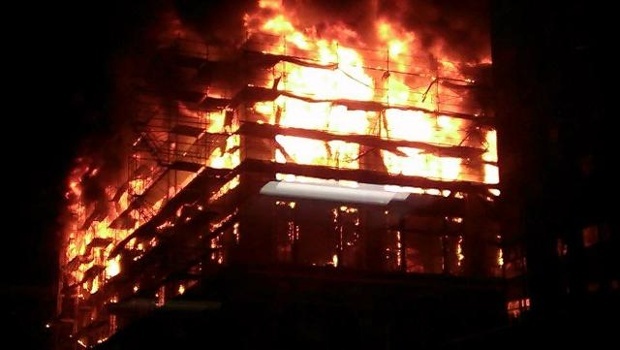 According to press reports, an early morning fire at the Metals Building on Iowa State University campus on Friday, June 29, 2012, was extinguished with a hand-held extinguisher. The Ames Tribune states no injuries have been reported in a fire that damaged electrical equipment at Iowa State University in Ames. http://bit.ly/N2Ekeq The Ames Tribune reports that firetrucks were sent to the university’s Metals Development Building at 8 a.m. Friday. Heavy smoke was pouring from a room on the second floor. Firefighters used an extinguisher to put out the flames. Ames Fire Department Capt. Rich Higgins says the fire damaged only electrical equipment. The fire cause is being investigated. Protex Central provides clean agent fire suppression systems featuring NOVEC 1230 Fire Protection Fluid by 3M to automatically protect hazards such as electrical rooms. Visit www.protexcentral.com to learn more about NOVEC 1230 Fire Protection Fluid by 3M and other clean agent fire suppression alternatives.